( ; ; Salar: Göxdeñiz Velayat; Mongolian; Köke Naɣur) is a province of the People's Republic of China , named after Qinghai Lake . It borders Gansu on the northeast, the Xinjiang Autonomous Region on the northwest, Sichuan on the southeast, and Tibet Autonomous Region on the southwest. Qinghai was only relatively recently made a province of China. A large part of the area, historically called Kokonor/ Koknor in English until the early 20th century, lies outside of China proper and has been an ethnic melting pot for centuries, mixing Tibetan, Han Chinese, Mongol, and Turkic influences. It was a battleground during the Tang and subsequent Chinese dynasties when they fought against successive Tibetan dynasties. Qinghai was under early Ming dynasty control. Prior to 1724, most of the area that is now Qinghai was under Tibetan control, but in that year it was conquered by the armies of the Qing Dynasty . Following the defeat of the Dzungars by the Qing in the mid 18th century, the area became home to peoples from what is now northern Xinjiang known as the Kokonor Mongols (Kokonor is the Mongol language name of Qinghai). In 1928, Qinghai became a province of the Republic of China . Subsequently it became the primary base for warlord Ma Bufang, before it became a province under the People's Republic of China in 1949. Qinghai is located on the northeastern part of the Tibetan Plateau . The Yellow River (Huang He) originates in the middle of the province, while the Yangtze and Mekong have their sources in the southwestern part. The average elevation of Qinghai is over 3000 meters above sea level. Mountain ranges include the Tanggula Mountains and Kunlun Mountains . Its average temperature is approximately -5 to 8°C, with January temperatures ranging from -18 to -7°C and July temperatures ranging from 5 to 21°C. It is also prone to heavy winds as well as sandstorms from February to April. By area, Qinghai is the largest province in China - excluding the autonomous regions of Xinjiang, Tibet, and Inner Mongolia, which are technically not provinces. Qinghai Lake (Koko Nor) is the largest lake in the People's Republic of China . Qaidam basin lies in northwestern Qinghai. About a third of this resource rich basin is desert. The basin has an altitude between 2600 to 3300 meters. The Sanjiangyuan National Nature Reserve (SNNR), also referred to as the Sanjiangyuan Nature Reserve, or the Three Rivers Nature Reserve, is the area of Qinghai province, PRC which contains the headwaters of the Yellow River (Huang He), the Yangtze River (Chang Jiang), and the Mekong River (Lancang Jiang). The SNNR was established to protect the headwaters of these three rivers. The reserve consists of 18 subareas, each containing three zones which are managed with differing degrees of strictness. All of these are in turn divided into four districts, two county-level cities, thirty counties, and seven autonomous counties. Qinghai's economy is amongst the smallest in all of China. Its nominal GDP for 2008 was just 96.2 billion RMB (US$13.8 billion) and contributes to about 0.3% of the entire country's economy. Per capita GDP was 17,389 RMB (US$2,500). Its heavy industry includes iron and steel productions, located near its capital city of Xining. Oil and natural gas from the Chaidamu Basin have also been an important contributor to the economy. The population of Qinghai is approximately 5.2 million, among which the Han account for 54.5%. Other groups include the Tibetans 20.87%, Hui 16%, Tu 4%, Salar, and Mongols. Qinghai's culture is heavily influenced by China proper and Tibet, given the close proximities as well as a shared history. The Lanqing Railway, running between Lanzhou , Gansu and Xining , the province's capital, was completed in 1959 and is the major transportation route in and out of the province. A continuation of the line, the Qinghai-Tibet Railway through Golmud , has become one of the most ambitious projects in PRC history. It was completed in October 2005 and now links Tibet with the rest of China through Qinghai. Six National Highways run through the province. Xining Caojiabu Airport provides service to Beijing, Lanzhou , Golmud and Delingha. Since the Ministry of Information Industry began its "Access to Telephones Project", Qinghai has invested 640 million yuan to provide telephone access to 3860 out its 4133 administrative villages. At the end of 2006, 299 towns had received Internet access. However, 6.6 percent of villages in the region still have no access to the telephone. These villages are mainly scattered in Qingnan Area, with 90 percent of them located in Yushu and Guoluo. The average altitude of these areas exceeds 3600 meters, and the poor natural conditions hamper the establishment of telecommunication facilities in the region. Satellite phones have been provided to 186 remote villages in Qinghai Province as of September 14, 2007. 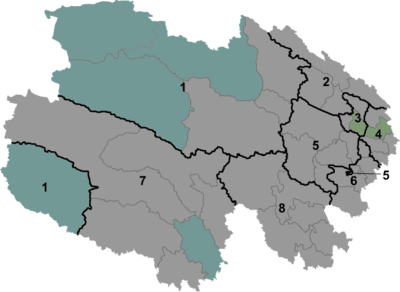 The areas benefited were Yushu Zang Autonomous Prefecture and Guoluo Zang Autonomous Prefecture. Qinghai has recently been provided with satellite telephone access. In June 2007, China Satcom carried out an in-depth survey in Yushu and Guoluo, and made a special satellite phones for these areas. Two phones were provided to each village for free, and calls were charged at the rate of 0.2 yuan per minute for both local and national calls, with the extra charges assumed by China Satcom. No monthly rent was charged on the satellite phone. International calls were also available. Many tourist attractions center on Xining , the provincial seat of Qinghai. During the hot summer months, many tourists from the hot Southern and Eastern parts of China travel to Xining, as the climate of Xining in July and August is quite mild and comfortable, making the city an ideal summer retreat. Qinghai Lake ( , qīnghǎi hú) is another tourist attraction, albeit further from Xining than Kumbum. The lake is the largest saltwater lake in China, and is also located on the "Roof of the World," the Qinghai-Tibet plateau. The lake itself lies at 3,600m elevation. The surrounding area is made up of rolling grasslands and populated by ethnic Tibetans. Most pre-arranged tours stop at Bird Island ( , niǎo dǎo). An international bicycle race takes place annually from Xining to Qinghai Lake.